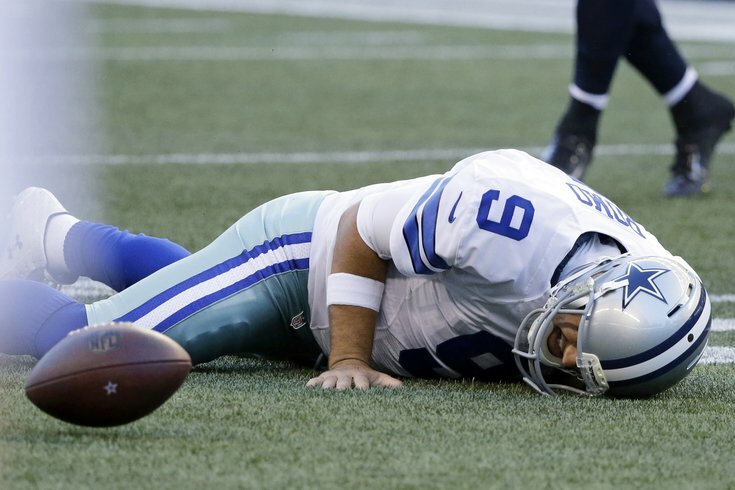 Tony Romo's back is injured... again. Philadelphia Eagles training camp has come and gone, as well as the first three preseason games, with "back of the roster" players mopping up in the fourth and final preseason game coming up this Thursday. 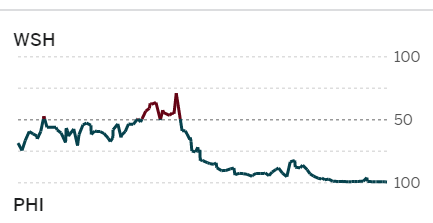 To date, the Eagles have not suffered any major injuries to players of note. • WR Josh Gordon: Gordon was reinstated back into the league, but he will still have to serve a four game suspension to start the 2016 season. • DE Desmond Bryant: Bryant led the Browns a season ago with 6 sacks. He tore his pectoral muscle and was placed on IR, ending his season. • OLB Armonty Bryant: The Browns' other Bryant was suspended for four games for violating the league's policy on performance enhancing drugs. He was second to Desmond Bryant last season with 5.5 sacks. • CB Kyle Fuller: Fuller is the Bears' best corner. He had arthroscopic surgery on his knee less than two weeks ago, and is out indefinitely. It's not out of the question that he could return for the Bears' Week 2 matchup against the Eagles, but it's unlikely. • C Hroniss Grasu: Grasu started eight games for the Bears in 2015, and was projected to be their starting center in 2016. He tore his ACL and is done for the season. • RB Le'Veon Bell: Bell was suspended for four games for violating the league's substance abuse policy, which was later reduced to a three -ame suspension, meaning that the star back will still miss the Week 3 matchup against the Eagles. • WR Martavis Bryant: Bryant was suspended for the entire season for violating the league's substance abuse policy multiple times. Bryant had 765 receiving yards and 6 TDs in 11 games in 2015. • TE Ladarius Green: Green was placed on the PUP list to start the season, which automatically disqualifies him from returning to the lineup until after Week 6. The Steelers gave Green a four-year, $20 million contract this offseason, and he was expected to start at tight end. • TE Brandon Pettigrew: Pettigrew is on the PUP list and will not return until after Week 6. • OLB Junior Galette: The Redskins' highly talented pass rusher tore his Achilles and is done for the season. • QB Teddy Bridgewater: The Vikings' starting quarterback suffered what was described as a gruesome injury today, and it appears likely that he will miss the entire season. • QB Tony Romo: Romo broke a bone in his back in the Cowboys' third preseason game against the Seahawks. The initial prognosis was that he would miss 6-10 weeks, but later the Cowboys did not put a timetable on his return. The Eagles' Week 8 matchup with Dallas would be around 10 weeks from when Romo suffered his injury. • DE Randy Gregory: Gregory was initially suspended for four games for violating the league's policy on substance abuse, but he could face an additional suspension that would leave him sidelined for at least 10 games. • LB Rolando McClain: McClain was suspended for 10 games for violating the league's policy on substance abuse, meaning he will miss the Cowboys' Week 8 matchup against the Eagles. • LB Jaylon Smith: It was widely expected that Smith would miss the entire season when the Cowboys drafted him in the second round of the 2016 NFL Draft, and nothing has changed.